I've said it before and I'll say it again, PPC and SEO need to get along. Why? There are such awesome tools on each side that can benefit the other. Not to mention the wealth of information from one that can feed results in the other. Case and point today is a tool that has not been written about much in the SEO world, but is a substantial part of the new AdWords training. Looks like a mind map doesn't it? I was introduced to mind maps in my Introduction to Creative Advertising class as a part of my advertising minor at UT Austin. Basically it's getting every association you have with an idea, thought, or concept out on paper with it's close associations. This is a tool that just about every level of marketing can benefit from, not just the creative people. There are whole computer programs developed just to aid with mind maps. Wonder Wheel is a part of Google results. Just go Google something, and look in the left side bar. Under the "Standard View" section (you might need to expand the menu over there), there is an option for "Wonder wheel." Click it and watch the magic. The awesome part of Wonder Wheel is that this is a mind map using Google's "mind." You want a peek into the big brain that is Google? This is your opportunity. Wonder Wheel returns everything from word ideas to organic and integrated results. You get pictures, shopping, paid ads, and competitors in one fell swoop. Wonderwheel is great for many things, not just keyword research. So hold onto your pants, here we go. The first, and most apparent use is for brainstorming. With any idea, product, or keyword, you can easily see what Google thinks is related. Using the start of one key phrase, this tool can lead to product ideas, marketing angles, and more. Multiple clicks on every spoke will open your eyes to new ideas and possible search intentions. For example, looking up "cake pans" lead me to square cake pans (not what you normally think about), 3D cake pans, and even "how to make a wedding cake." Those are all just key phrases during brain storming, but it really is what you do with this information that makes it valuable. In brainstorming, you are just identifying everything possible, the organization comes later. The first piece of information to glean from Wonder Wheel is competitive information. Through the tool you can see popular brands of products that users are searching for. It doesn't stop there though. As you click through Wonder Wheel, the search results change with the phrase you select. This allows you to see and investigate new competitors. The long or mid tail might have completely different competitors, and may include some new up-and-comers (maybe you!) that you need to be aware of for the future. In PPC, this tool is touted to be best for campaign and ad group organization, specifically getting keywords into themes for the display network. For SEOs, the same concept can be applied site structure and design. If you are having issues wondering how best to set up your site's architecture that will be easy for Google and the other search engines to understand, this is perfect. For example, if you have a site about stuffed animals, a quick search using the Wonder Wheel shows that searchers are looking for stuffed cats and dogs, and some competitors include Toys R Us and Build a Bear. From this information, you might structure the site by animal, size, and also by brand. Oddly like Brainstorming, yes? Sorta. But keyword research is more focused than brainstorming. Brainstorming is writing down any and everything related to a topic. Keyword research is more focused to specific content. 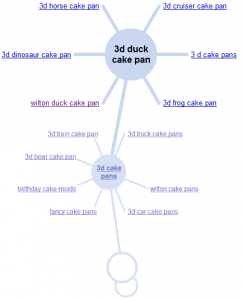 So let's say that you need to research a new 3D duck cake pan. 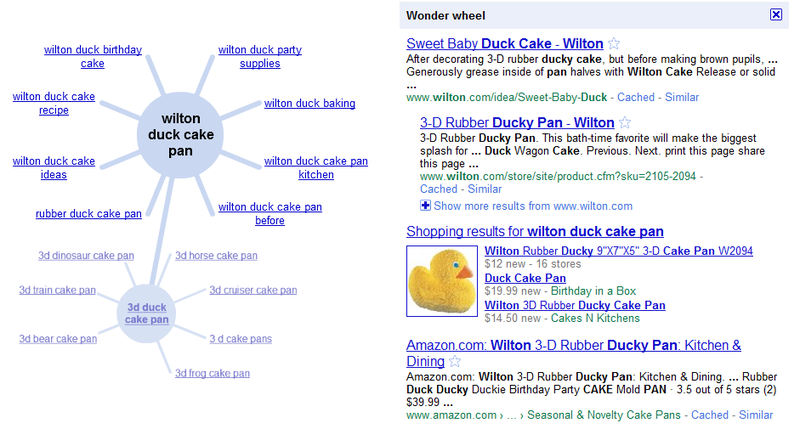 Just a quick search and click on "Wilton Duck Cake Pan" reveals the many ways that someone might search for a duck cake pan. Writing good content for your site is key to ranking for long tail terms, and Wonder Wheel can help spark ideas. For example, remember in brainstorming when we came across the idea "how to bake a wedding cake" and seeing square wedding pans? How about a "how to bake a square tiered wedding cake." There are posts on unusual cakes and how to assemble one, but not a start to finish post including pictures. See the draw here? If you are looking to develop a site around your favorite hobby (baking cakes perhaps? going along with my examples), using Wonder Wheel can reveal possible companies to approach for affiliate relationships. In this instance, reselling cake pans through Amazon, Wilton, or Birthday in a Box. This is revealed in the results of keywords but also in the organic results and in the shopping results.